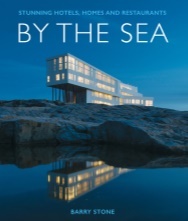 By the Sea features more than 50 unique properties throughout the world that have their footprints on some of the world’s most wonderful beaches. Featuring a mix of residential homes, hotels, restaurants and cafes, each property has been carefully selected for its aesthetic value, history, and ambience, and their success in blending with, and adapting to, their enviable beachfront locations. The wonderful photography in this book highlights the unique nature of each property and is a vital component in their selection. The accompanying text by the experienced travel writer Barry Stone brings to life their individual stories.